This tourney will bring back childhood memories of afternoon hockey games played against friends. This annual tournament has been a huge hit, bringing the locals out to cheer on teams from all over Colorado, New Mexico, Michigan and Texas! The 3-on-3 round robin format insures that everyone plays at least 2-3 games (plus tourney play), local restaurants ensure that everyone eats well, and the Tommyknocker Tavern hosts live music for evening entertainment. And new this year: The Creede Repertory Theatre will be putting on a performance of Boomtown on Friday night around 7pm! Creede has two ponds just north of town that serve as the host site for this tournament. 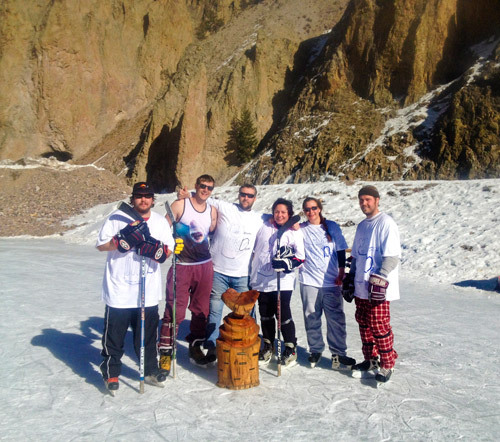 The ponds are at 8900 feet, making this one of the highest pond hockey tournaments on earth. The scenery is incredible! Updated facilities include a warming hut, and (NEW) zamboni shed constructed by Carhartt and Jason Mamoa’s Pride of Gypsies in February 2015! You will be skating beneath 800 ft canyon walls with wildlife roaming nearby. Bonfires burn near the ponds all day, and our warming hut offers food and drinks. This Pond Hockey Tournament will bring back childhood memories of pick-up games played against friends. Pure fun, not levels. There were always a few good players – and everyone else. That is what the Golden Pick is all about! For Durango players: a Level 1 Team for pond hockey in Creede would have one Level 1 player, one or two level 2 players, and the rest level 3 and4 players. A Level 2 Team would have 2 or 3 level 3 players and the rest level 4 or 5. Please check the registration packet for more information. Please note what level of team you are a part of! Drive into Creede on Highway 149 and take a left at the gas station. Drive over the small bridge and take a right. You are now on Main Street. Follow this street through town (about 8 blocks). The road curves left, and comes to a stop sign. Take a right to continue into the canyon. The ponds will be just ahead the the right, and the Community Center is in the cliffs to the left! In February 2015, Jason Mamoa and his production company “Pride of Gypsies” arrived in Creede to film a series of commercials and ads for Carhartt. Filming took place on the hockey ponds and in other areas in Mineral County. As a big THANK YOU to the community of Creede, a Zamboni shed was constructed at the hockey ponds! 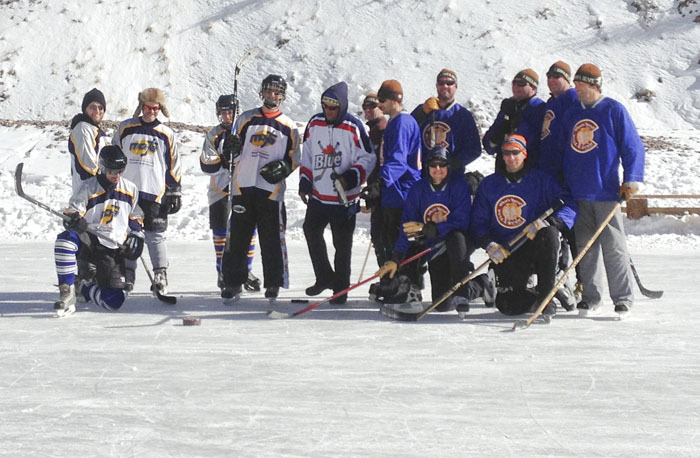 “The Golden Pick” Tommyknocker Pond Hockey Tournament is planned again for 2015! This tourney will bring back childhood memories of afternoon hockey games played against friends. This annual tournament has been a huge hit, bringing the locals out to cheer on teams from all over Colorado, New Mexico, and Texas (and we are extending our invitation to hockey rinks all across the west)! The 3-on-3 round robin format insures that everyone plays at least 2-3 games (plus tourney play), local restaurants insure that everyone eats well, and the Tommyknocker Tavern hosts live music for evening entertainment. Creede has two ponds just north of town that serve as the host site for this tournament. 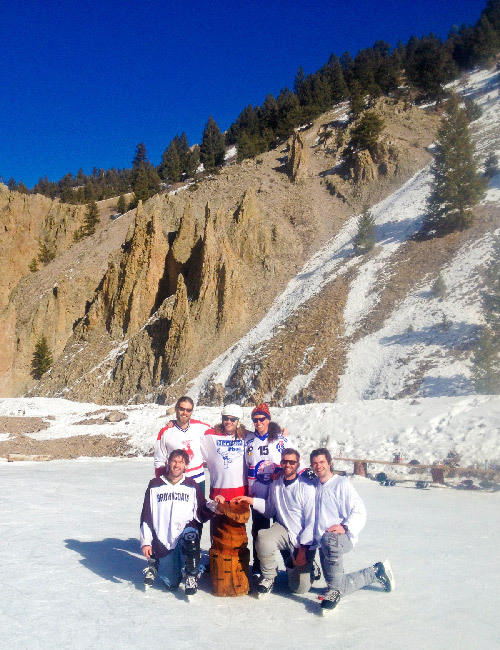 The ponds are at 8900 feet, making this one of the highest pond hockey tournaments on earth. The scenery is incredible! You will be skating beneath 800 ft canyon walls with wildlife roaming nearby. Bonfires burn near the ponds all day and the Community Center opens their bar and offers “locker room” space. The winners in A league were “One Chick, Six Stix” from Boulder/Golden…..the winners in B league were “Mighty Drunks” from Gunnison/Lake City. 16 teams participated this year, with several Creede/San Luis Valley teams, a few Durango teams, and players from all over the state…. Metroplex Christian Hockey Association from Dallas was again the farthest traveling team! Thank you Creede for your contributions towards the tournament! ….. MDS TRASH and KARL KOLISCH LUMBER made in-kind donations along with the MINERAL COUNTY FIRE DEPARTMENT and the CITY OF CREEDE. Thanks to Coffee of the Fly and MJ’s for providing food and drinks! 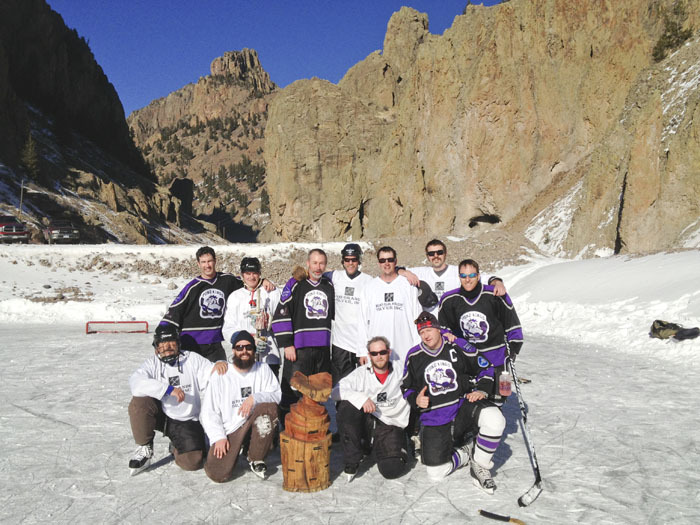 “The Golden Pick” Tommyknocker Pond Hockey Tournament is planned again for 2014! 11 teams participated this year, with several Creede/San Luis Valley teams, a couple of Durango teams, and players from all over the state…. Metroplex Christian Hockey Association from Dallas was again the farthest traveling team! The MVP of the tournament was RON FIEF for his contributions toward the ice management….. MDS TRASH and KARL KOLISCH LUMBER made in-kind donations along with the MINERAL COUNTY FIRE DEPARTMENT and the CITY OF CREEDE.